Stems: Decumbent, spreading, or ascending, with ascending or erect sterile shoots. Plants pilose. Leaves: Mostly opposite, at least proximally, simple; blades narrowly lanceolate to linear-oblong or linear, 2/5 to 1.6 inch long, 1/25 to 1/6 inch wide, tip acuminate, margins entire. Flowers: Usually radially symmetric: calyx 1/5 to 2/5 inch, lobes 5, subulate, hairy; corolla white, pale blue, or pale pink, salverform, tube 1/3 to 1/2 inch, glabrous, lobes 5, obcordate, 1/5 to 1/3 inch, apex notched, notch 1/25 to 1/6 inch; stamens 5, fused unequally in corolla tube; style 1, 1/2 or less as long as corolla tube, stigmatic lobes 3, ca. 1/2 as long as style. Fruits: Capsules ovoid, 1/6 to 1/5 inch, surface slightly bumpy. Habitat: Tallgrass prairies and mixed-grass prairies, usually in shallow soil over limestone. 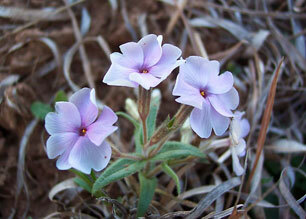 Distribution: The entire range of Oklahoma phlox covers about 10 counties in southern Kansas, central Oklahoma, and northeastern Texas. Populations are concentrated in the southern Flint Hills and Red Hills in Kansas and Oklahoma.